Focused Inbox separates your inbox into two tabs—Focused and Other. Your most important email messages are on the Focused tab while the rest remain easily accessible—but out of the way—on the Other tab. 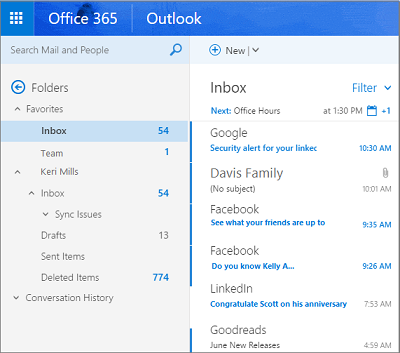 In Outlook for Windows, Focused Inbox is only available for Office 365, Exchange, and Outlook.com accounts. If you don't see Focused and Other in your mailbox, you might have a Clutter folder instead. See Use Clutter to sort low-priority messages in Outlook for more information. How do I turn off Focused Inbox? In Outlook, select the View tab. The Focused and Other tabs will appear at the top of your mailbox. You’ll be informed about email flowing to Other, and you can switch between tabs any time to take a quick look. From your inbox, select the Focused or Other tab, and then right-click the message you want to move. If moving from Focused to Other, choose Move to Other if you want only the selected message moved. Choose Always Move to Other if you want all future messages from the sender to be delivered to the Other tab. If moving from Other to Focused, choose Move to Focused if you want only the selected message moved. Choose Always Move to Focused if you want all future messages from the sender to be delivered to the Focused tab. The instructions are slightly different depending on whether you're using the new Outlook on the web or the classic version. Choose the version you're using to see the instructions that apply to you. Open Outlook on the web. At the top of the page, select Settings . Select the toggle next to Focused Inbox. Top move a message from Focused to Other, select Move > Move to Other inbox. Select Always move to Other inbox if you want all future messages from the sender to be delivered to the Other tab. If moving a single message from Other to Focused, select Move > Move to Focused inbox. Select Always move to Focused inbox if you want all future messages from the sender to be delivered to the Focused tab. Select Settings > Display settings > Focused Inbox. Under When email is received, select Sort messages into Focused and Other. The Focused and Other tabs will appear at the top of your mailbox. You’ll be informed about email flowing to Other, and you can switch between tabs any time to take a quick look. If moving a single message from Focused to Other, select Move to Other inbox. Select Always move to Other inbox if you want all future messages from the sender to be delivered to the Other tab. 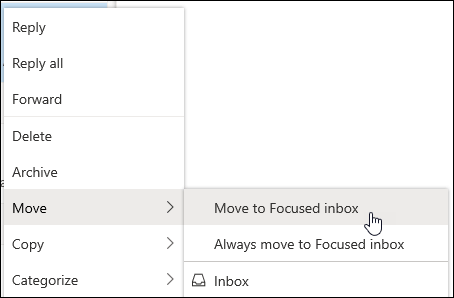 If moving a single message from Other to Focused, select Move to Focused inbox. Select Always move to Focused inbox if you want all future messages from the sender to be delivered to the Focused tab. Select Settings , then turn on Focused Inbox. At the top of your mailbox, in the email messages list, select between Focused and Other. You can switch between the tabs any time to take a quick look. 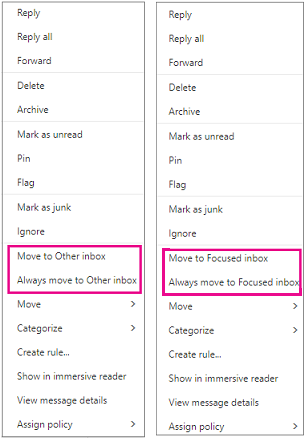 If moving a single message from Focused to Other, choose Move > Move to Other inbox. Choose Always move to Other inbox if you want all future messages from the sender to be delivered to the Other tab. 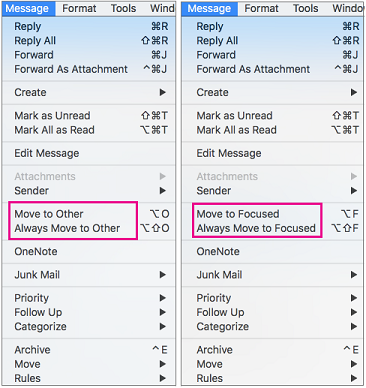 If moving a single message from Other to Focused, choose Move > Move to Focused inbox. 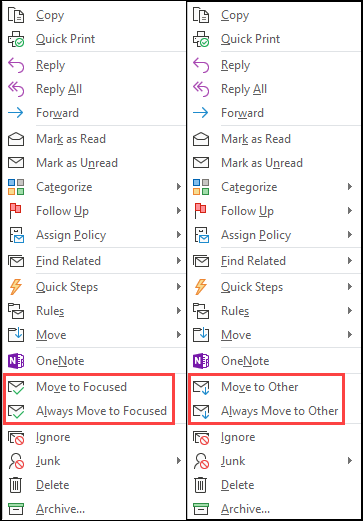 Choose Always move to Focused inbox if you want all future messages from the sender to be delivered to the Focused tab. In Outlook 2016 for Mac, Focused Inbox is only available for Office 365 Business Emails. Open Outlook 2016 for Mac. On the Organize tab, select Focused inbox. The Focused and Other tabs will appear at the top of your inbox. You’ll be informed about email flowing to Other, and you can switch between tabs any time to take a quick look. Tip: You can set the badge count—the count of unread mail—to include only the messages in the Focused list. See Outlook > Preferences > Notifications and Sounds > Badge count to adjust this setting. From your inbox, select the Focused tab, and then select the message you want to move. Select Message > Move to Other if you want only the selected message moved. Choose Message > Always Move to Other if you want all future messages from the sender to be delivered to the Other tab. Select Message >Move to Focused if you want only the selected message moved. Choose Message > Always Move to Focused if you want all future messages from the sender to be delivered to the Focused tab. 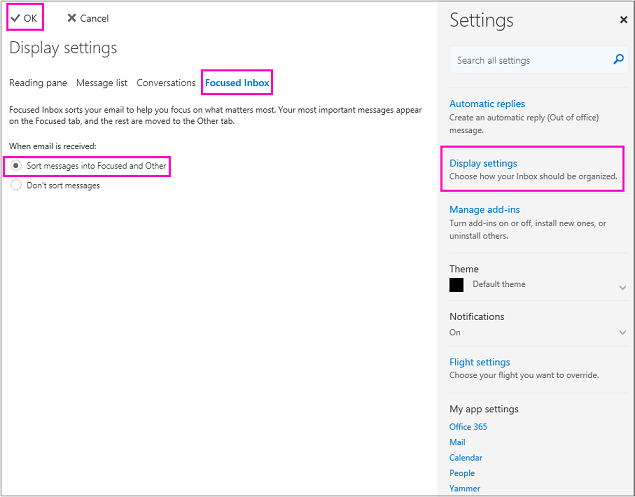 In Mail for Windows 10, choose Settings > Focused Inbox. Slide Sort messages into Focused and Other to On. From your inbox, select the Focused tab, and then right-click the message you want to move. Choose Move to Other if you want only the selected message moved. Choose Always Move to Other if you want all future messages from the sender to be delivered to the Other tab. From your inbox, select the Other tab, and then right-click the message you want to move. Choose Move to Focused if you want only the selected message moved. Choose Always Move to Focused if you want all future messages from the sender to be delivered to the Focused tab. Why don't I see Focused Inbox in my Outlook? For the latest information on Focused Inbox availability see our blog post. How does Focused Inbox work with Clutter? Focused Inbox will replace Clutter. After switching, you'll no longer receive less important email in the Clutter folder. Instead, email will be split between the Focused and Other tabs in your inbox. The same algorithm that moved items to the Clutter folder now powers Focused Inbox, meaning that any emails that were set to move to Clutter will now be moved to Other. Any messages already in your Clutter folder will remain there until you decide to delete or move them. Can I keep using Clutter instead of Focused Inbox? You can keep using Clutter for now. Eventually, Clutter will be replaced by Focused Inbox. If I turned off Clutter, will I still be able to try Focused Inbox? Yes. You will be able to turn on Focused Inbox as described in the instructions above. Does Focused Inbox organize all the mail in my inbox as soon as I turn it on? Yes. As soon as you enable Focused Inbox, you’ll see the Focused and Other tabs at the top of your Inbox. The more you use Focused Inbox, the smarter it gets about how it organizes your messages. 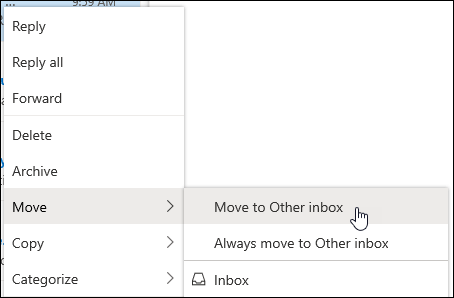 You can also teach Outlook what matters most to you by moving emails between Focused and Other, and setting overrides to make sure emails from certain senders always show up in a particular destination. I’m using Focused Inbox already on Outlook for iOS or Android. Does anything change for me? Nothing will change in Outlook for iOS or Android. 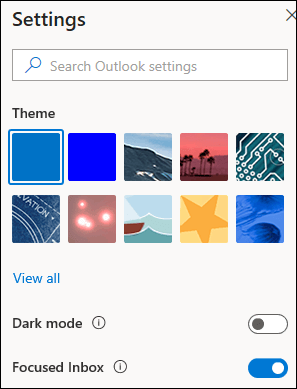 As our Outlook desktop and web apps are updated to include Focused Inbox, the content of your Focused and Other tabs will be the same across all your Outlook clients.